November 29, 2011  American Airline's parent company AMR has filed for bankruptcy protection. American will continue to operate its flights as usual. The airline will use bankruptcy to off-load some of the debt that is weighing it down. 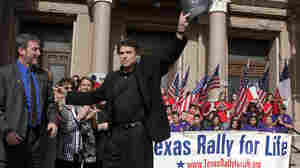 November 10, 2011  Texas Gov. 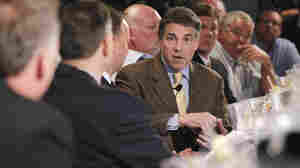 Rick Perry drew a blank at last night's GOP presidential debate, forgetting one of three federal agencies he would eliminate if he becomes president. October 19, 2011  Most U.S. airlines are turning a profit these days but not American. 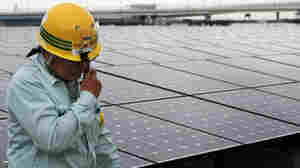 The carrier is expected to announce on Wednesday that it lost money in the third quarter. October 17, 2011  A huge deal in the energy business is just the latest signal that natural gas is a hot commodity. One of the largest natural gas pipeline operators, Kinder Morgan, is buying its rival El Paso for $21 billion. October 12, 2011  The man allegedly at the center of the plot to kill the Saudi ambassador is Manssor Arbabsiar. He is a naturalized American citizen who has lived in Texas for the last 30 years. He first lived in the Dallas area, then Corpus Christi and finally outside Austin. October 1, 2011  Texas has implemented widespread water restrictions due to a historic drought. Still, many large Texas cities are using up to 200 gallons of water per person per day. 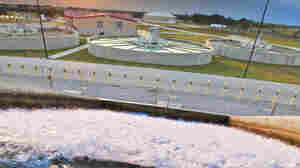 San Antonio is guzzling much less with the help of a state-of-the-art water treatment plant. September 20, 2011  Texas Gov. 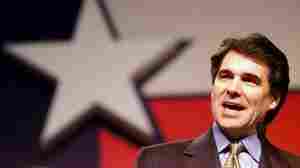 Rick Perry likes to hold out the Lone Star State as a model — his vision for the country. But while Texas' growing economy has been a reliable jobs producer, the state's health care system is straining. Many family planning clinics that help serve the large numbers of uninsured in Texas have seen cuts. One supporter calls it a "war on birth control." September 16, 2011  The most dramatic moment of the GOP debate in Florida revolved around Gov. Rick Perry and his 2007 executive order mandating that young girls in Texas get the HPV vaccine. In 2007, this move mystified Republicans and revealed what some saw as a backroom deal. September 6, 2011  Across Texas, scores of wildfires are burning out of control. A fire near Austin has burned thousands of acres and hundreds of homes. The Texas Forest Service says whatever the highest priority is, that gets the first attention. August 26, 2011  At an East Texas auction, the animals look pitiful. They're standing in 107-degree heat with their ribs showing, stressed out. 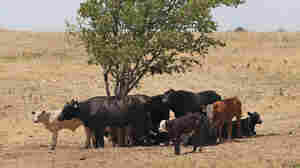 The heat — and lack of rain — has forced many ranchers to sell off their stock. Many will retire; and few young ranchers are ready to step in. August 17, 2011  Private sector job growth is a centerpiece of Texas Gov. Rick Perry's presidential campaign. But the state has a consistent history in that area that can be traced back at least 20 years. August 12, 2011  When Gov. 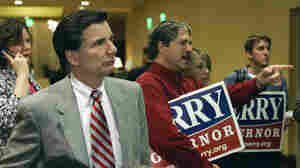 Rick Perry announces his candidacy on Saturday, there will be a new sheriff in the GOP presidential contest — a man who, in more than two decades of electoral politics, has never lost a race. Perry was born and raised in West Texas, where he picked up survival skills that could come in handy. 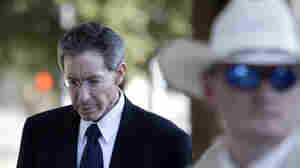 July 29, 2011  Warren Jeffs' trial began with him firing his defense lawyers and announcing he would represent himself. Jeffs has been playing musical chairs with his lawyers for months now hiring and firing them, then asking the court for more time so his new lawyers could get up to speed only to fire them again and ask for even more time. Jeffs faces 95 years in prison if convicted of two counts of sexual assault of a child.